Memperkenalkan Jug Soya Maker Milk Rm130. Kini membuat susu soya, bijirin2 lain dan juicer buahan dengan sangat mudah... sangat segar juga.. This is a fully automatic home kitchen appliance can be used to make soymilk and also others eg. Five grains milk, Full bean milk, and Mung bean milk. 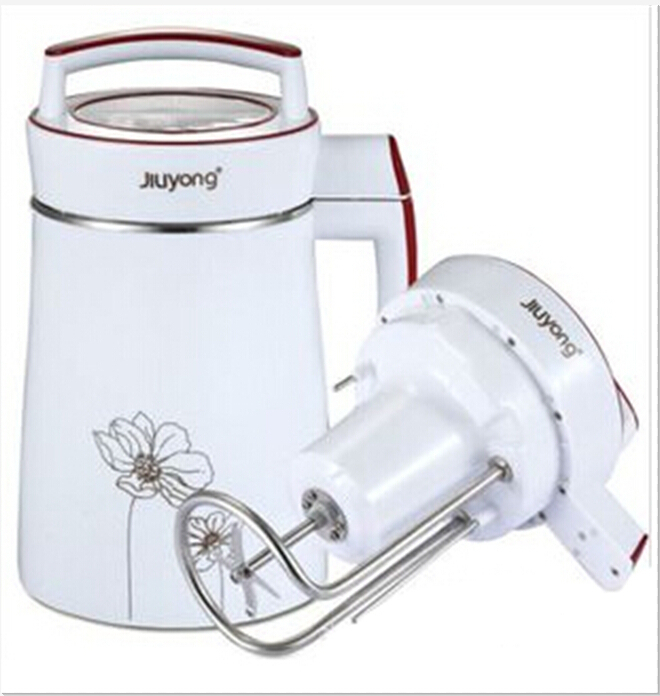 It also can be used to make rice paste, corn juice and grains paste. It is computer controlled, and will automatically pre-heat, grind, and cook. Just push a button, the fresh, creamy soymilk is ready to enjoy within 30 minutes! Soy protein products can be good substitutes for animal products because, unlike some other beans, soy offers a 'complete' protein profile. Soy milk has about the same amount of protein as cow's milk. Unlike cow's milk, it has little saturated fat, low sugar and no cholesterol . It's a healthier way gradually getting into a more vegetarian lifestyles. Like Oat, Barley, Brown Rice, Millet, Maize, and more, consumption of multi-grains help decrease in risk factors for cardiovascular disease, pre-preventing from the clinical problems like hypertension, diabetes, and obesity. Lot of natural ingredients have healthy cholesterl-lowering properties, significant of Dietary fibre, Protein,Iron, Magesium, Vitamins, and with low fats and calories. You may call them as "green pearls". It helps body in detoxification, thirst-quenching, control weight, anti-inflammatory, antioxidant. In the summer, It cools your body naturally. In the winter, It relieve Inflammation after you eat too much holiday turkeys, alcohol , rich food like pizzas, fries, BBQ wings or family banquet. Fruit smoothies are scrumptious and satisfying. All it takes is a scoop of thick-and-creamy peanut butter, and you've got yourself a protein-packed snack. Or now you may consider to add more energy or more nutrients by adding your Iso protein, 6-pack muscle skimmer, or blending with ices cubes, flavoured ingredients, now your are on your own home-made styles. Blending your baby's food on healthier way, adding spinach, carrots, celery, beets, rice paste, oats, fish and more. Soybean milk maker packaging as follows: single color box packaging, every 6 units in a. 1, time and energy, the operation is simple: intelligent control of automatic operation mode, more than ten minutes to make nutrition delicious breakfast, and at this time also can do other things, can effective use of time. 2, taste delicious, but according to his be fond of free collocation with nutritious breakfast. 3, health, nutrition diet is tie-in, ziyin runfei, educational brain, spleen and liver and warm. 2. Fresh, homemade soya milk in around 25 minutes. 3. High efficiency motor and alloy steel knife. 4. Automatic milling and boiling. 5. Temperature control with thermal protection device. 7. Powerful stainless steel blades for perfect blending. 8. Double layer stainless steel jug design, to prevent noise and hot. 9. Does soymilk, almond milk, cappuccino, tofu and much more. 10. Voted the number 01 consumer for their quality and service. 11. Recommended by nutritionists and vegetarian groups. 12. Non-stick cooking plate for easy cooking.